The cake is just sweet....if you want more, increase the sugar content. I am sending this entry for "Cook For Yourself " event hosted by Radhika who is celebrating her first blog anniversary! congrats on ur award...ur eggless cake is luking very inviting...will give it a try. Wow Renu, such a eyepleasing and droolworthy carrot cake, congrats for winning whole gran event dear..keep rocking! 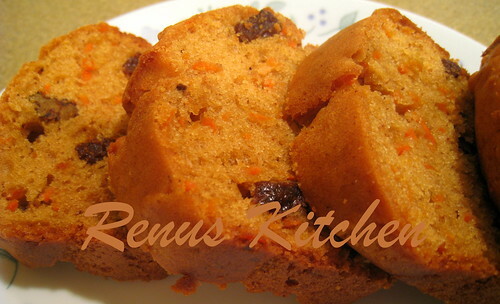 Soft and spongy...Healthy carrot cake looks yummy and beautiful. Oh! That cake looks so amazing! p.s. Congrats on your award! Lovely cake, congrats on your award. Love carrots in any form, carrot cake looks yum yum!! Yummy looking moist carrot cake, shall try replacing egg with curd. Thanks for the tip. Looks very soft and fluffy, just like a cake with eggs. Looks colorful, thanks for sending it across for the event. Congrats renu! !Wishing many more to come! Cake looks awesome and very soft..perfect bake renu..Never tried cake without egg..will try ur version and let u know. Congrats on the award.The cake looks super moist and delicious. Loved the texture of ur eggless cake. Even i use thick yogurt for eggless cake. Nice healthy cake. YUM! Cake looks so moist and spongy. Pic makes me to drool. Looks delicious, Renu!COngrats on the card:)You do have a wonderful blog! The texture of this cake look awesome! I love trying out eggless cake recipes to try and find the best one- so that I can stick to it :D Congreats on your award and i'm definetly trying the cake out! :D Thanks for sharing! congrats for the award Renu n this cake is such a healthy n yummy recipe...the photo looks perfect!! baking soda and baking powder both 1/2 tsp? just wanted to recheck with you. Yes, both are 1/2 tsp. Make sure you use thick yogurt. Also, cakes with yogurt take little longer to bake. Great cake! !can't wait to try. Just wanted to clear avfew doubts - 2 carrots meaning approximately one cup? And can I use eno instead of baking soda? @ Sweta: you can add 1 cup of carrots. It is OK. I really don't know if you could substitute baking soda with eno, have never tried. I feel it should be fine, but not sure. If you decide to use, do let me know the results. Good luck.